"...businesspeople can learn a lot-in a good way-from magicians..."
THIS is the time of year when holiday decorations go up on Main Street, radio stations battle to find the most obscure Christmas songs, and lists of the “best business books of the year” spring up like kudzu. The problem, at least when it comes to business books, is multifold. Should you compare an investment book to one on management or information technology? You can rank them by sales, but that doesn't add much value: if they are selling well, people already know about them. Instead of scouring the best-seller lists for end-of-year business wisdom, I decided to identify three books that got lost in the shuffle in 2006. Armed with a strong sense of purpose, you…need to be able to create ideas out of nothing, solve impossible problems and make it all seem effortless, writes Andy Cohen, founder of the advertising agency Exposed Brick. If that sounds as if you need to be a magician, it's no accident: Mr. Cohen is a board member of the Society of American Magicians. 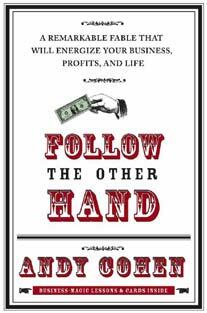 In "Follow the Other Hand" (St. Martin's, $22.95), he creates a fable involving a struggling business and uses magic as a metaphor for thinking differently and generating new solutions. Your guide through the tale is Merlin, who resembles Henny Youngman more than the wizard from Arthurian legend. But once you get past his vaudeville patter (Did you hear the joke about the scientist who invented a new deodorant called Invisible? You rub it on and disappear, leaving everyone wondering where the smell is coming from”), the magician makes simple, solid points. To succeed, you need to challenge assumptions, forge unshakable trust with your customers, create something akin to a classic magic trick to define your brand, concentrate relentlessly on your source of competitive advantage, and remove obstacles that keep you from your goals. Merlin explains how magicians do all this, going so far as to reveal the secrets behind a handful of well-known tricks. And because this is a fable with a happy ending, our struggling business owner comes up with a seemingly magical plan of his own by the time this sprightly book ends. One (or more) could make a best-seller list in 2007.